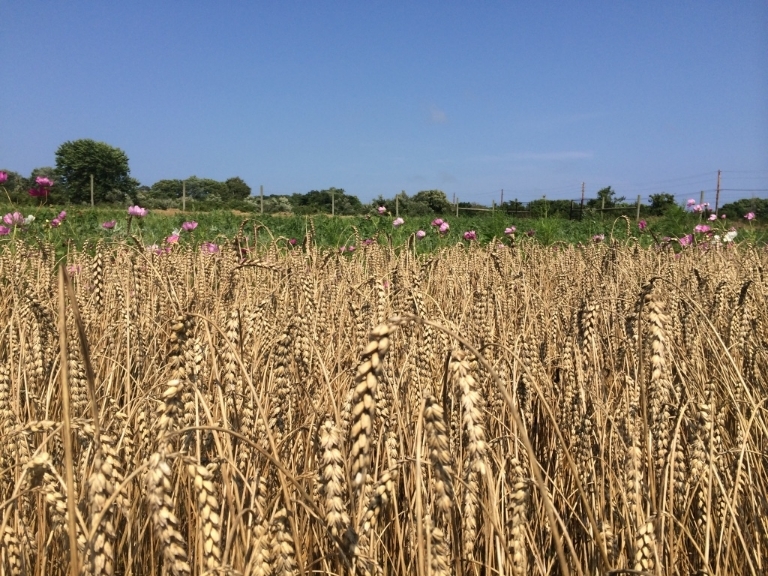 Amber Waves Farm launched the Amagansett Wheat Project in 2009 to reintroduce wheat and other small grains to the East End of Long Island’s diverse foodshed. In ten growing seasons, we have harvested more than 25 tons of wheat as our planted acreage has increased from one to our current 5 acres. We plant several varieties, each with its own culinary specialty - hard red wheat used for wheat berries and bread flour, and soft white and red wheats used for pastry flour. We use a small tabletop mill called the KoMo Fidibus Classic to mill our wheat berries, which uses four-inch milling stones to slowly grind the berries, keeping the temperature low and maintaining the natural flavor of the grain. We mill all flour orders on demand, allowing us to provide the freshest product possible. After a successful 2015 field trial of the gluten-free grain sorghum, we have decided to include it in our permanent grain line-up going forward. We plan to expand our grain growing trials to include barely, buckwheat, hulless oats, rye, millet, amaranth, popcorn, rice, quinoa, sesame seeds and flax. As we continue to trial new grains and work to become better grain farmers, we'll also continue our collaborations with other nearby farms, including Mecox Bay Dairy and Quail Hill Farm, as these partnerships are crucial to the success of the Amagansett Wheat Project. We sell our wheat berries and whole wheat stone ground flour at the farm and at the Montauk Farmers Market. Be sure to look for Amber Waves Farm wheat berries on restaurant menus throughout the Hamptons!